HZ096 Trade Show Zip-Loc Badge Holder. 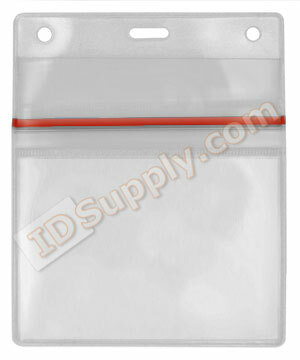 Clear vinyl badge holder with slot and chain holes. Perfect for trade shows and events where your need to carry around several event passes, business cards, IDs, folded notes, etc. Max Insert Front & Back Pocket: 4" x 3"
Max Insert Middle Pocket: 4" x 4-1/2"